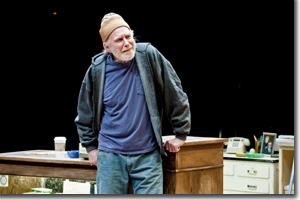 After a play wins the Pulitzer Prize and the Tony Award, the playwright's next effort is invariably compared to the award-winning gem, usually coming up short, at least in critics eyes, and often with audiences as well; however, as time progresses, reassessments may grudgingly reverse these myopic judgments and reveal the prejudices of the observers and the steady brilliance of the playwright. For example, the comedies and experimental pieces of Arthur Miller and Tennessee Williams often shine from this distance. 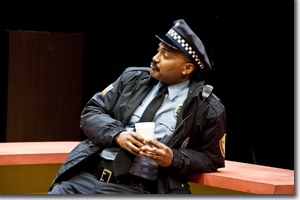 So, Tracy Letts' Superior Donuts, his follow up to the blockbuster August: Osage County, was awaited with great anticipation (and, hopefully, without limiting preconceptions)—and it doesn't disappoint; in fact, it confirms that Letts' talent is growing as fast as his reputation. 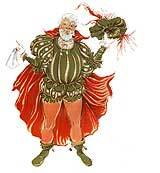 Writers will tell you that characters write the story and Letts never fails to deliver characters writ large. The Superior Donut shop, in the heavily Polish Uptown neighborhood of Chicago, is the domain of Arthur Przybyszewski (Mike Hartman), who inherited the place from his folks. Letts reveals Arthur to us in two ways—through the story itself and Arthur's narrative reminiscences that fill in his history and his ever-evolving perspective as he approaches his 60th birthday. Coming of age in the late '60's, Arthur was profoundly shaped by the Vietnam War, against which he protested in the streets and resisted by going to Canada, until President Jimmy Carter declared amnesty—to heal wounds, as some believe, or to let students off the hook for their country's wars, as others would frame it—after which, the draft was abandoned in favor of using the poor and the brainwashed for canon fodder. Arthur still wears a pony tail, smokes pot, reads literature, and bakes some of the best confections this side of Krakow, when not playing host to the neighborhood irregulars: the homeless alcoholic, Lady Boyle (Kathleen M. Brady); a couple of cops with hearts of gold, Officer Randy Osteen (Jeanne Paulsen) and Officer James Bailey (Earl Baker Jr.); the testy Russian immigrant DVD store owner, Max Tarasov (Robert Sicular), and his gigantic and kind nephew, Karil Ivakin (Jeffrey Evan Thomas); the sly Puerto Rican bookie, Luthor Flynn (John Hutton), and his rabid, meth-baked enforcer, Kevin Magee (Scott Thomas); and, finally, the bright, aspiring 21-year old African-American writer, Franco Wicks (Sheldon Best). Hartman is nothing short of terrific as his Arthur comes to grip with his past and opens up to the future, mostly under Franco's influence, after the high energy kid convinces Arthur to give him a job. 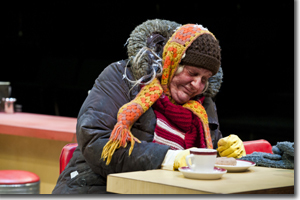 Best's winning performance as Franco, in combination with Hartman's impressive arc, aided and abetted by director Bruce K. Sevy's pitch-perfect cast, give full expression to the tragic and comedic elements that define this well wrought drama—all amplified by Lisa M. Orzolek's finely detailed set, which takes full advantage of the depth of the in-the-round Space Theatre. Despite the nagging presence of the decaying social structure and crime-infested atmosphere of the neighborhood, Letts finds redemption in those who choose to make their stand here—a far cry from what we might expect from the author of Bug and August: Osage County—but just as effective in confounding critics and surprising audiences as Miller and Williams in their day. 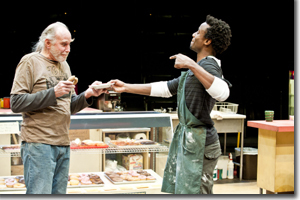 The Denver Center Theatre Company's production of Superior Donuts runs through May 7th. 303-893-4100 or www.denvercenter.org.